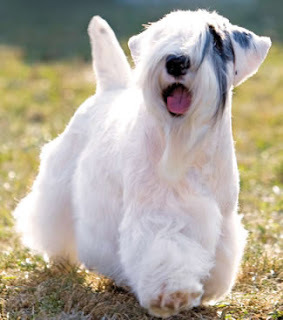 The Sealyham terrier belongs to the terrier type and was originally developed in Wales. Their measurements may vary according to their country of origin. In general it measures 10.5 to 12 inches in height and weigh 23-25 pounds. The males are generally heavier than their female counterparts. The color of the coat is white and it can come with or without markings in a variety of colors which include lemon, black, brown, blue, and badger (mix of brown and black). When a puppy Sealyham is very active, however, as it grows, it becomes lazy and is often referred to as “the couch potato of the terrier world.” They love to lie here and there and take naps. It displays a good sense of humor along with the characteristics of a terrier i.e determination, sensitivity, alertness, inquisitiveness and good spirit. He adores his family and remains devoted. He does not like to be kept aloof and would love to snuggle up close to you. Moreover, he gets along well with children. Training it is not a piece of cake but once trained is quite obedient. Normally a quiet dog, it is wary of strangers and will bark to announce their presence. He gets along well with other dogs and moreover it is adaptable and may live anywhere whether an apartment or a farm. Grooming of this dog is even easier if you cut his coat short every few months and hence would only need to be brushed. However, if you groom his coat to the breed standard then it requires daily brushing. It is generally a very healthy dog breed living up to 15 years. However, since they are not active dogs, one needs to manage their weight through calorie management and exercises sometimes.